Heavy Duty Seamless Copper Starter Lugs combine pure copper construction with a seamless pad to provide the ultimate performance in strength, conductivity and corrosion resistance. The lug design and features a flared and chamfered barrel to facilitate cable insertion. 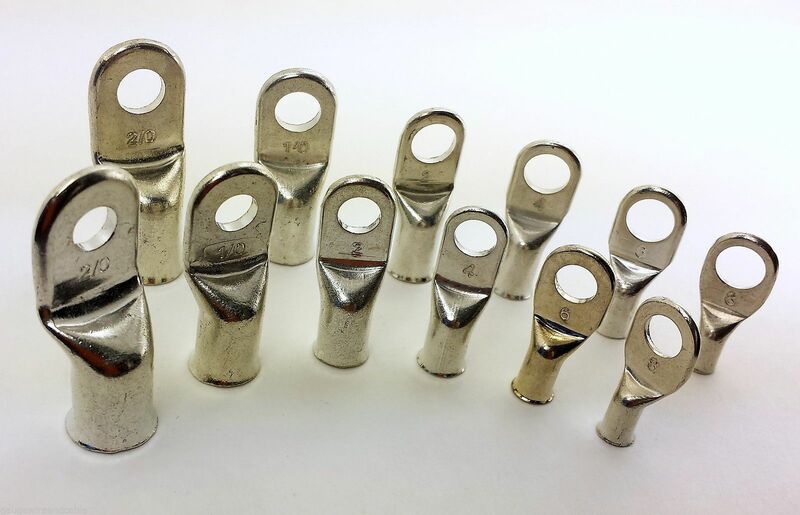 These lugs are sized and designed to work with flexibly stranded copper wire and cable such as welding cable, marine battery cable, UL Listed battery cables, SAE battery cables, entertainment cable, diesel locomotive cable, and other similar flexible cables. The hole sizes on the lugs are sized to fit the bolt of the same size so a 5/16 hole lug will fit a 5/16 inch bolt etc. The 5/16 lugs will also fit M8 metric as will the 3/8 lugs fit the M10 size metric bolts. Great quality connectors at the lowest price I’ve seen. We’ve tried all sizes available and they work great. Fast shipping too.